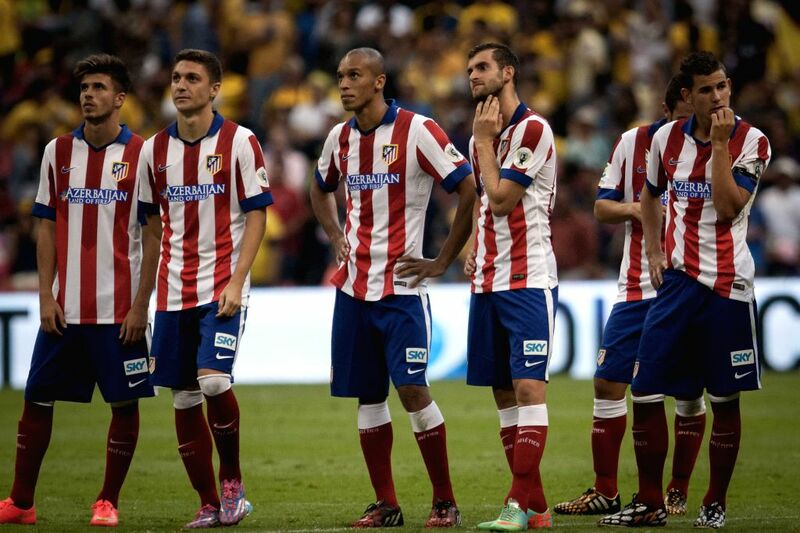 MEXICO CITY, July 31, 2014 - Players of Atletico de Madrid react after the match of the EuroAmerican Cup against America held at Azteca Stadium in Mexico City, capital of Mexico, on July 30, 2014. America's Raul Jimenez (L) vies for the ball with Mario Suarez (R) of Atletico de Madrid, during their match of the EuroAmerican Cup held at Azteca Stadium in Mexico City, capital of Mexico, on July 30, 2014. America's players celebrate their victory after the match of the EuroAmerican Cup against Atletico de Madrid held at Azteca Stadium in Mexico City, capital of Mexico, on July 30, 2014. America's Luis Gabriel Rey (L) vies for the ball during the match of the EuroAmerican Cup against Atletico de Madrid held at Azteca Stadium in Mexico City, capital of Mexico, on July 30, 2014.